The AIMA Managing India Awards was established with an aim to recognize achievers who have made a fundamental difference and have created an edge above peers for others to emulate. Since its inception in 2010, these Awards have been conferred on leading icons from the Indian industry, media, sports and entertainment. Over the years, AIMA Managing India Awards have become one of the most coveted leadership honours in the country and are greatly valued. The 9th edition of the AIMA Managing India Awards was organised on Wednesday, 18th April, 2018 at Durbar Hall, Hotel Taj, Diplomatic Enclave, New Delhi. Col. Rajyavardhan Rathore, Hon’ble Minister of State (I/C) of Youth Affairs & Sports and Information & Broadcasting, Government of India was the Chief Guest. Earlier in the day, Ms Indu Jain, Chairperson, Bennett Coleman & Co Ltd also received the Lifetime Contribution to Media Award. The Programme was attended by over 500 guests. 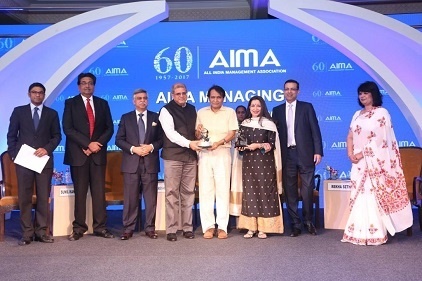 The Eighth edition of the AIMA Managing India Awards was held on Thursday, 27 April, 2017 at Hotel Taj Palace, New Delhi to honour stalwarts from various fields at a glittering function attended by the who’s who of India. 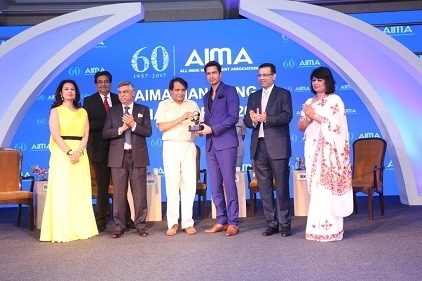 The AIMA Managing India Awards aim to recognise the contributions of those who have set benchmarks of excellence in their respective spheres and have helped build Brand India - stalwarts from different fields, who have excelled in their respective spheres with vision and inspiration and are worthy of emulation and admiration. Mr Suresh Prabhu, Minister for Railways, Government of India was the Chief Guest and Mr Babul Supriyo, Minister of State for Heavy Industries and Public Enterprises, Government of India was the Guest of Honour at the awards ceremony. • MNC in India of the Year – Kenichi Ayukawa, Managing Director & CEO, Maruti Suzuki India Ltd.